Major Hurricane Florence will likely threaten portions of the North and South Carolina coast with life-threatening surge, extreme wind, and flooding rains on Thursday. 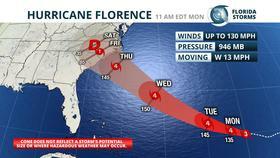 Hurricane Florence is then likely to slow down or even stall across the Piedmont this weekend, putting millions at risk for extreme flooding from South Carolina to Virginia. 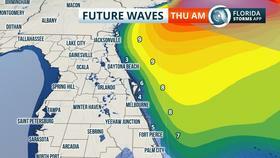 Even though the center of Florence is likely to stay hundreds of miles away from Florida, its large and powerful circulation is expected to send ocean swells all the way to Florida's Atlantic coast this week. In a special statement from the National Weather Service Jacksonville, Meteorologist Cindy Elsenheimer said the risk of life-threatening rip currents along area beaches will “increase as Florence gets closer” by midweek. She also advised boaters and mariners to use caution in nearby adjacent waters where building waves and rough surf could make it difficult to operate small vessels. In addition to the waves, the persistent onshore flow and tidal rises due to a new moon will elevate the chance for flooding in flood-prone areas of coastal communities through Thursday at times of high tide. 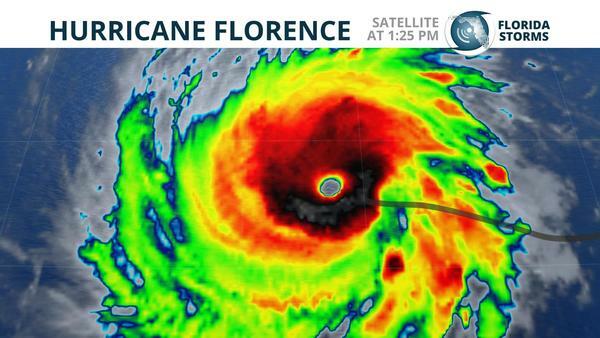 Hurricane Florence strengthened from a Category 1 to a Category 3 storm in less than 12 hours, which is rare but explicitly forecast by the National Hurricane Center (NHC) Sunday. The presence of warm ocean temperatures and relatively light winds aloft created an environment favorable for such intensification. Conditions near Florence are expected to remain favorable for additional strengthening through Wednesday, when the season's first major hurricane is likely to become a Category 4 storm. As Florence approaches land, the hurricane's wind field is expected to grow in geographic size with time, increasing the risks for storm surge and inland wind threats. The Storm Surge unit from the National Hurricane Center advised on Twitter they would likely issue a Storm Surge Watch for portions of the South Carolina coast by Tuesday morning. In his key messages Monday, NHC Hurricane Specialist Eric Blake said fluctuations in intensity are possible as the storm approaches land due to eye wall replacement cycles, but regardless of its exact intensity, he had “increasing confidence” that Florence will be a large and dangerous hurricane at landfall. The average track error from the National Hurricane Center four days out is about 140 nautical miles, and the dangerous hazards from Florence will extend well away from the center. Forecast confidence is higher than normal with Florence through Wednesday, lending credence to the idea it will be approaching the coast of North or South Carolina by Wednesday night. However, specifics on where and when it might come ashore, where it might go next, or if it stalls are too difficult to pin down at this time. A fleet of aircraft from NOAA and the U.S. Air Force Reserves have been surveying the storm's lower and upper-level conditions, providing valuable data that will be considered in future forecasts. 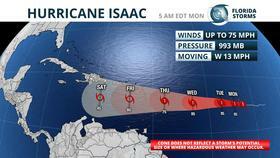 The Florida Public Radio Emergency Network is also keeping a close eye on Hurricane Isaac, which was churning through the central Atlantic with maximum winds of 75 mph Monday afternoon. Isaac is forecast to move into the eastern Caribbean Sea by Thursday, but the National Hurricane Center has expressed a higher than normal uncertainty on its eventual track and strength beyond Wednesday. At the present time, Isaac, nor any of the other tropical cyclones in the Atlantic basin, pose an immediate threat to Florida.